The evening of Mother’s Day brought some research time. Some super fabulous, tree growing, exciting research time. See the end of the Young line up there? The couple handily highlighted in yellow with an asterisk? James Young and Janet Robertson? Yes them. They did not use to be there! Their son, James Young was my previous end of line individual. The last time I worked on him was many years ago when I was a fresh faced, tentative researcher. I had gently attempted to find his death record and was quickly overwhelmed with the sheer number of James Youngs there are in Scotland. I set it aside for other research projects. Well, last week I was tidying up some things in Family Tree on FamilySearch and noticed that someone had made a mess with James Young (1824-1895). I cleaned up the mess and began sourcing James and his family. Sunday evening I completed attaching the sources I had for James. I decided to re-look at my previous searches for his death record. They were not good. I didn’t use very good search parameters and the results were massive. No wonder I set it aside. I’m older, wiser and a far more seasoned researcher now. So I started a new search and found his death record on scotlandspeople after purchasing one list and one record – that came to $2.37 for a long desired death record. His death record contained exactly what I needed to verify it was a record for my James and it had his parent’s names! I just pushed my Young line back another generation!! I was able to go on and find his birth record in the OPR (Old Parish Registers) and a possible match for him with his parents and siblings in the 1841 Scottish Census. But seriously?! Another James Young? And Janet Robertson? Oh boy. Where are the unusual names when I could use them? It seems I descend from a loooong line of James Youngs. 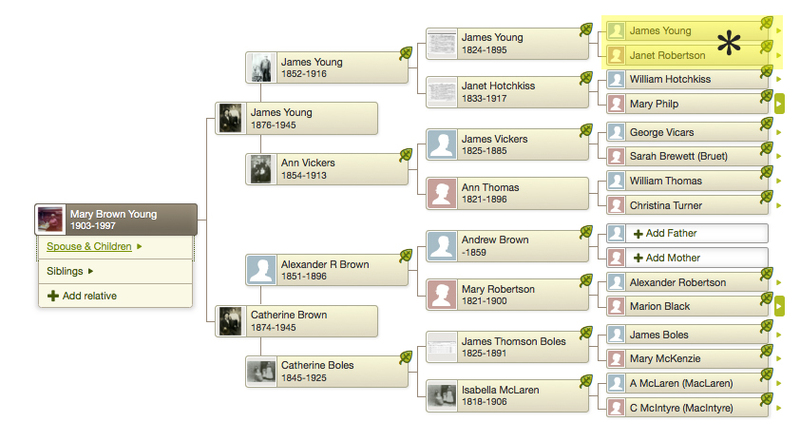 My great grandmother Mary Brown Young even had a brother named James Young who died at the age of 7. The name James Young stopped there for my line. That is FIVE James Youngs in a row that I know of. I descend from lots of oldest sons. I wonder if my new James Young is also the son of a James Young? I plan to find out. Do you have any lines with common names repeating for multiple generations? note – I have been meaning to write a post about scotlandspeople for many months now. It is one of my FAVORITE websites. This post is reawakening the niggling. I need to do that. But May is a very busy month for me so in the meantime, if you have Scottish ancestors and you have never used scotlandspeople – IT IS FABULOUS, give it a try! Hooray! I love scotlandspeople. It’s pretty great to become seasoned isn’t it? Thanks for stopping by. It is a great site, it has the good fortune (for itself) of having the monopoly on these kinds of records, being the only one granted permission to reproduce the images of the Scottish censuses and all the parish registers and civil registration records. It is great for wills too and all kinds of other records. The only downside I find is the part where you have to part with credits to see the results of a search before you even get to see a record. I think that is pretty mean, especially with the abundance of common names. Considering how much they charge in credits to view records I don’t see the need to charge 1 credit for each page of search results. Yes it might make you a bit more savvy in terms of narrowing down your search field in order to bring up less pages of results, but that’s not always so easy to do. Really glad you got back another step! One thing to remember is that Scottish burial records are pretty sketchy, dependant on the area. Some kept records, some didn’t. Some were lost. So sometimes pinning down a death and burial pre-1855 can be tough. It is good if you can find a site that has records of headstones as you may find details there where a burial register is non-existent. I agree on the 1 credit for a list thing. If the lists were free I would likely purchase more records. I have Young, Brown, and Smith lines on my Scottish side so those lines are bit tricky. Thankfully I also have Boles, Vickers, & Hotchkiss and those are much easier. I started my Scottish research at the FHL in Salt Lake. They have a large portion of the parish records on microfilm. Once I started hitting a few holes I began using scotlandspeople and became hooked! It’s pretty great. Yeah, it does make you less likely to purchase more – especially if you use up the cost of a record just in getting the list of results to find the appropriate entry. Not very cost effective! My husband has a large chunk of his ancestry in Scotland so I use the site pretty regularly! I could spend plenty of money chasing those lines down. It has forced me to learn some excellent tricks so that I am more efficient. I really appreciate all of these new websites you’re throwing out, Amberly. I don’t have multiple generations of men or women with the same name. I do have a John Kelley that I’m at a dead end with because his name is so common. I pushed him aside years ago, just like you did to your 2nd James Young. You’ve inspired me to try him again. Know any good sites for Champaign County, Ohio? He has some great tips that I’ve found useful to find websites specific to a locale. One of his tips might help you find something. Yes, in doing my family research I found that my mother’s 3rd Great Grandfather, also was my father’s 4th Great Uncle. Than another thing I found was my mother’s Father’s side of the family 5th Grandparents was also my Grandma’s ( his wife) 4th Great Grandparents. I guess the oldest daughter married who would become my grandfathers family line; while the youngest daughter married on who would become my grandmothers family line. Those common names really make us into better researchers!